Palm oil is the world’s most popular vegetable oil. According to the Rainforest Foundation UK’s ethical shopping guide, palm oil is commonly found in many packaged items in the supermarket, from ice cream to shampoo and bread to detergents. But it is not without its problems. Indonesia and Malaysia are the world’s biggest producers of palm oil, but as their lands have become saturated with palm plantations, businesses have turned to countries like Papua New Guinea (PNG) in pursuit of profit. PNG currently ranks as the third biggest exporter of palm oil globally, with 95% of exports bound for the EU. Palm oil production on the remote island nation has significantly increased since the mid 2000s, peaking at an all-time high in 2010 with exports totalling $450m. According to Global Forest Watch, 91% of PNG’s forests were classed as primary in 2010, meaning they were largely untouched by human activity. This may change as palm oil production increases, as has been the case for PNG’s wealthier neighbour Indonesia. Clear-cutting land to make way for palm oil plantations not only affects biodiversity and local livelihoods, it also releases vast quantities of carbon dioxide into the atmosphere. Greenpeace UK says that, globally, deforestation constitutes “up to one-fifth of global man-made emissions, more than the world’s entire transport sector”. The Pacific Climate Change Science Program predicts that climate change in PNG will result in rising sea levels, warmer temperatures and higher annual rainfall. This will have significant effects on PNG’s economy, through factors such as higher rates of malaria, stress on infrastructure, changing agricultural patterns and social conflict associated with the displacement of coastal communities. The Asian Development Bank (ADB) estimates the economy of PNG will be the most affected by climate change in the Pacific region. “The biggest component of economic loss is agriculture and Papua New Guinea is being affected severely because of the relatively high temperature rise and also the shortage of fresh water,” says Cyn-Young Park of the ADB. Some of the small islands that make up PNG are already being inundated by rising sea levels. An encroaching shoreline has completely bisected Carteret Island, home of the world’s first climate change refugees, while locally grown coconuts, a food staple, are being wiped out as a result of coastal erosion on the atoll. Illegal logging, corruption, racketeering and repression are all too common in PNG and compound the associated environmental and human costs of palm oil production. There is some evidence that companies seeking palm oil concessions in PNG are actually more interested in timber and use it as a cover to sidestep logging restrictions. In the village of Gadaisu, which is located on PNG’s southernmost peninsula and is home to just a few hundred people, local residents are acutely aware of the effects palm oil is having on their way of life. The wider region, Milne Bay province, is economically reliant on palm oil, tourism and gold mining. The villagers blame the decreased harvests on the chemicals found in fertilisers used by the palm oil industry. Instead of growing their own crops, residents now often have to go to town to buy food. Palm oil production has also introduced new pests that invade food crops in Gadaisu. Palm oil production occurs between Gadaisu and the region’s capital Alotau. Muttucumaraswamy says that palm oil is more environmentally destructive than local forms of food production, where the forest regenerates afterwards. 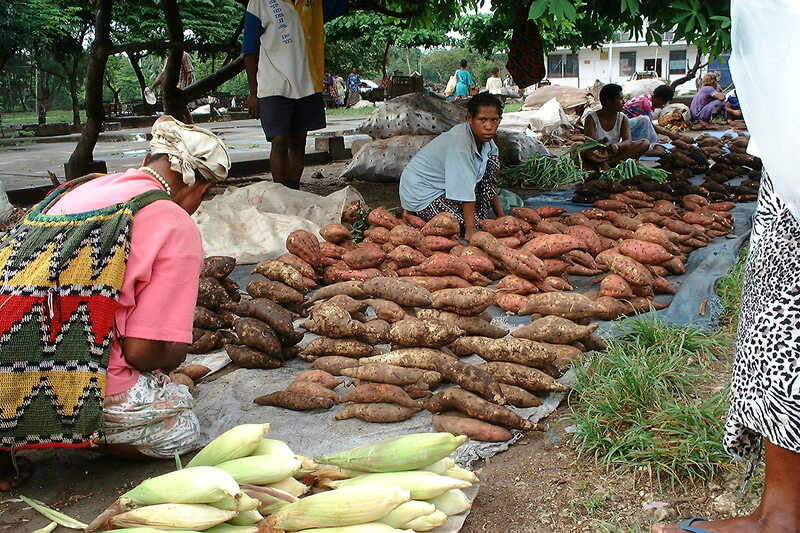 The villagers of Gadaisu live within a subsistence economy. They only have rudimentary agricultural tools and transport is a challenge. “The roads are pretty bad,” laments Muttucumaraswamy. Despite these challenges, many locals make money by selling the flesh of coconuts. They sell the dried meat, known as copra, at market and on a good day earn enough to then buy household staples such as rice, flour and sugar. Fishing is another source of income for the coastal town, although this is hampered by a lack of nets and boats able to venture into deep waters.